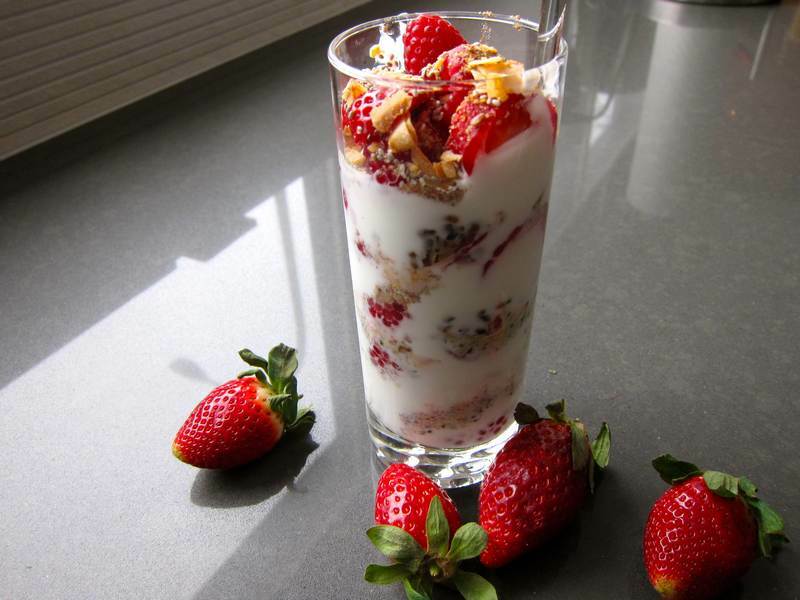 Breakfast Parfait – Way to Start Your Day! Apparently beer isn’t the only thing you can serve in a beer glass. As I was supposed to be clearing my mind and focusing on my yoga practice, I received knowledge in the form of a beautiful breakfast presentation. I always trusted that yoga could bring me inspiration and guidance. This “recipe” focuses on layering. Layering one nutrition packed ingredient over another and another. 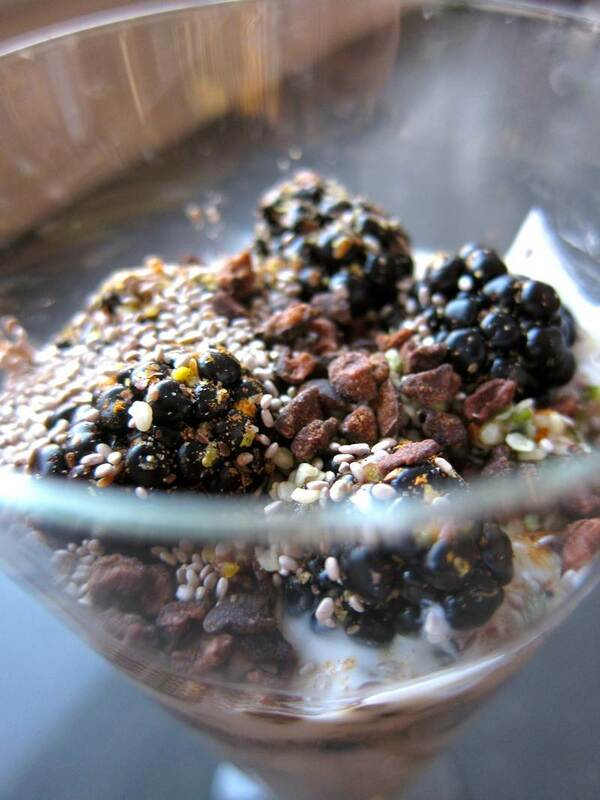 Select a clear glass and layer the yogourt, berries and seeds. Insert a straw or chopstick down the side of the glass in two spots, making a slender tunnel, then carefully, slowly pour in some maple syrup. Refrigerate for 30 minutes. I can’t begin to explain how delicious this was. I can’t wait to get back to Shri Yoga to see what else I can conjure up. Just started watching a beautifully filmed movie called “Nora’s Will” and noticed a refrigerator full of Post-it notes. Am very curious to know why a fridge would be full of notes. Being born without the organizer gene, I try to pick up on others’ systems. Whatever I do know about organizing, I owe to Susan Portnoy. After about 10 hours of her 5 night lecture series, I assimilated a thing or two. Thanks to Mona Keddy and Barrie Risman at Shri Yoga for heaps of inspiration and guidance. I apologize for meditating on food under your tutelage. A very special thank you to my new friend Isaac Lyles. You are wrong about football, the Giants will beat the Cowboys next year, I have it on good authority, but oh so right about M. F. K. Fisher’s “The Art of Eating.“ I hope that reading this 744 page tome doesn’t interfere with my blogging time or strain my thumbs from the sheer heft. Now that I have the quintessential food writing bible, I’ll be under more pressure to avoid words like delicious and scrumptious, which I’ve recently learned are signs of ignorant food writing. For your musical entertainment, a new take on Gimme Shelter. « Savoury Cheese Pie – Quick, Easy, Tasty and Oh So Pretty! your photography,- specifically the lighting,composition and colours are overtaking your writing. Who cares anymore what you have to say, the pictures are delicious! I met with a pro photographer for 2.5 hrs this am to learn the basics in operating a camera. I’m anxious to find out if I’ll be able to translate anything I “learned” into action. Aside from all that, I agree these photos do look good enough to consume. Wish I could say the same about some upcoming meat snaps! And I blame you for encouraging me to tackle beef. But, I love you all the same! Confront your food stresses with humour and bravery!! I am sure your upcoming recipe will be gorgeous.You are becoming as artistic as Julie! I agree – your photography makes me want to hurry to make this parfait… and with a beer glass too. Eating chocolate nibs in the morning amidst all the other beautiful ingredients? You’re my kind of gal! 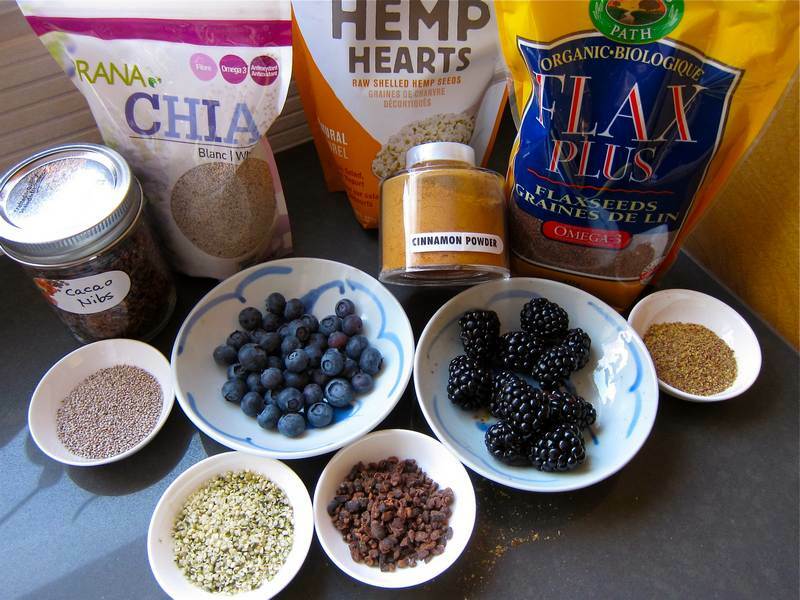 The granola I make is very similar, minus the hemp & chia – I posted it several weeks back! Happy New Year and a question.. is your daughter on the East Coast or West Coast? Because I’m in LA!